In 2009, the UK's Channel 4 broadcast a video purportedly taken on a mobile phone by a Sri Lankan soldier, as part of its "Killing Fields" documentary. The footage appeared to show the Sri Lankan army executing captured Tamil fighters during the closing phase of a civil war which had killed an estimated 100,000 people. The Sri Lankan government dismissed the video as a fake, calling it, "A sinister attempt to bring disrepute to the government." The United Nations concluded that the video was authentic, but because it did not meet courts' evidentiary standards no prosecutions could be pursued. Having been passed the footage by Channel 4 News Foreign Correspondent Jonathan Miller, the International Bar Association set out to prevent this from happening again. Last year, the International Bar Association, supported by LexisNexis, launched the eyeWitness to Atrocities smartphone app, which can verify images and data so that they are admissible as evidence in courts of law. It does this through technology that proves photos have not been altered by securely logging information like pixel configuration, and the time, date and location where an image was captured. Around 10,000 people have downloaded the app already, with expressions of interest from 136 countries. War zones represent the most extreme lack of rule of law, but not the whole spectrum. According to the United Nations, an estimated 4 billion people live outside the umbrella protection of the rule of law and these people often struggle for basic, human rights. If you're picturing countries outside U.S. borders, think again. The World Justice Project Rule of Law Index is one of the most comprehensive bodies of work on this topic. It documents countries' adherence to 44 rule of law indicators in categories including Absence of Corruption, Fundamental Rights, Civil Justice and Criminal Justice. Over 100,000 citizens and experts have been interviewed and 102 countries indexed to date. In 2015, Denmark was the highest ranking country on the Index, scoring 87 percent. Venezuela ranked lowest, with a score of 32 percent. In terms of rule of law, the U.S. is significantly behind many major industrialized nations, ranking 19th on the World Justice Project Index in 2015. U.S. rule of law scores fall behind Germany, Australia and Japan for example. 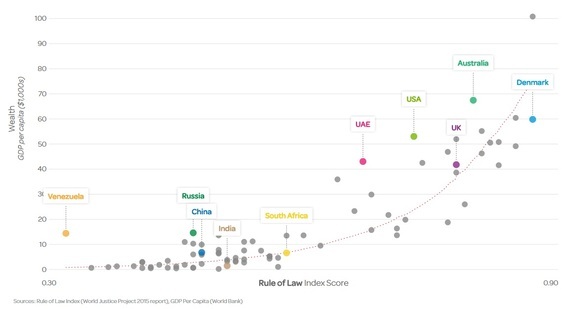 To get a better view of the social and economic impact of strengthening the rule of law, we've correlated data from the World Justice Project, the World Bank and Transparency International. Based upon statistical correlations among the World Justice Project Rule of Law Index and measures of economic and societal health such as GDP per capita, child mortality, homicide rates, levels of corruption and life expectancy, we estimate that over the next decade, a 10% increase in the rule of law mean score would have a transformational effect on both economic and social progress. GDP per capita would go up by about $7,000 per person. Child mortality rates would decline from 24 to 16 per 1,000. Crime would go down by more than 30%. Average life expectancy would increase by more than two years. This data is publicly available through an online, interactive rule of law tool, which allows users to explore the relationships between the rule of law and these economic and social indicators. 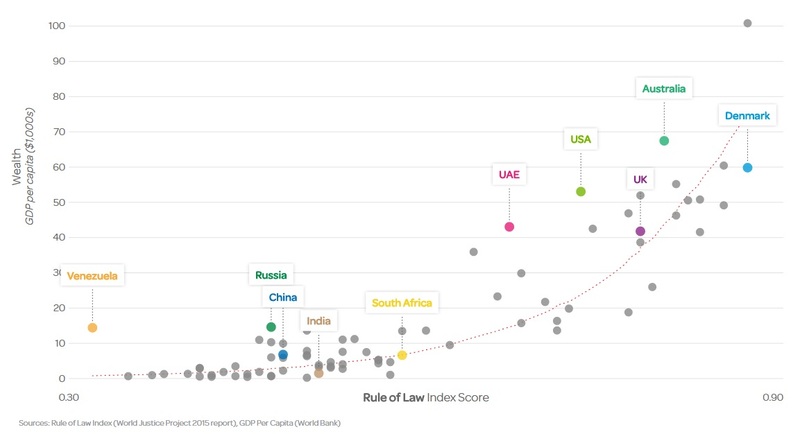 The correlation with GDP per capita is unsurprising given that rule of law is a critical factor which businesses take into account when deciding where to invest and expand operations. This is because the rule of law provides a legal foundation for conducting business in a reliable and predictable manner. 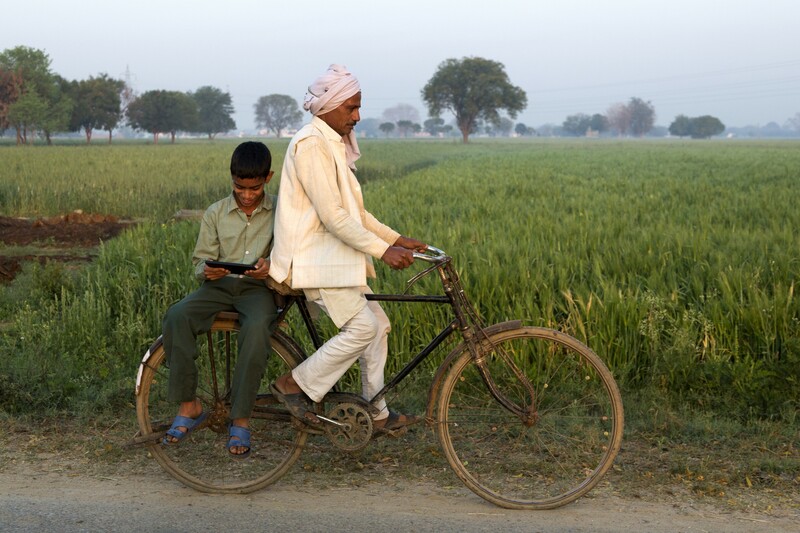 It promotes economic investment by increasing the protection of property rights and contracts. It allows for the timely and predictable resolution of disputes, lowers levels of corruption and bribery, and ensures the legal identity of individuals and organizations, providing greater security. So how can businesses support this virtuous cycle of stronger rule of law, increased investment, and economic and social advancement? The United Nations Global Compact has introduced the Business for the Rule of Law Framework, which suggests five key areas of activity for every business. First, businesses can ensure accountability by helping to reduce corruption and bribery, and creating more effective and transparent institutions. We can provide certainty by strengthening the enforcement of Intellectual Property and other property rights and strengthening labor and environmental standards. Businesses can promote equality by achieving legal identity for all, and enforcing non-discriminatory laws and policies. We can protect human rights by preventing violence and crime against women and children, and protecting fundamental freedoms. Finally, we can support access to justice by improving public access to information, including legal education and access to the legal profession. Business can play a powerful role in helping to drive change. By harnessing the innovation, creativity and energy companies display every day in their commercial activities, we can open up new markets and opportunities through supporting the rule of law. And in the process we can play a fundamental role in something much more important - enhancing the lives of billions of the world's most vulnerable people.